After days and days of steady rain, interspersed with occasional ferocious thunderstorms, crops at Heart & Sole Gardens are becoming weed-infested. June 11th was the first day in recent memory with no rain in the forecast and I decided to take advantage of the bright sun and damp soil, so I headed to the farm with weed-gripping gloves, given to me by daughter Kate, my trusty heart-shaped hoe and a small forked hand tool that is great for loosening weed roots from those of plants I actually want to grow. When I saw deep mud standing in most of the fields, I pulled on my knee-high rubber boots. Upon arrival, my worst fears were confirmed; okra and beans, plants that should have been growing in rows, were almost hidden by an assortment of rapidly spreading weeds. How do weeds grow much faster than plants we try to grow? And, have you noticed how many weeds mimic the “good” plants growing close to them? For example, there is a type of morning glory at the farm that intermingles with beans and the leaves of those two plants are almost identical at certain growth stages. Last year, I discovered the vetch I thought I was weeding was actually my black garbanzo beans! Vetch actually is not an abundant weed at Heart & Sole, but it certainly became a “friend” of those beans, much to my dismay. 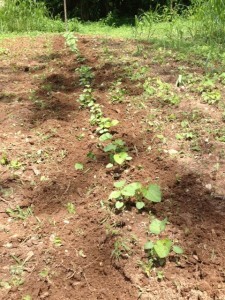 Weeds almost obliterate a row of young okra. 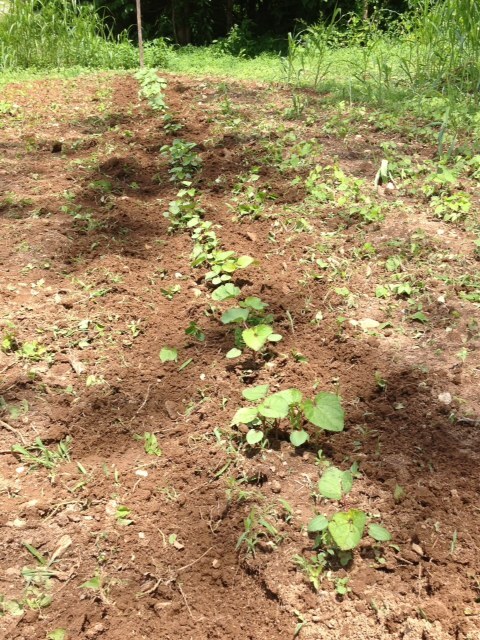 I first set to work with the okra “row” and after crab-walking and hand pulling, I was rewarded with a nice row of okra plants. Since one variety did not germinate with the first planting, I finished the empty space with another type of seed. 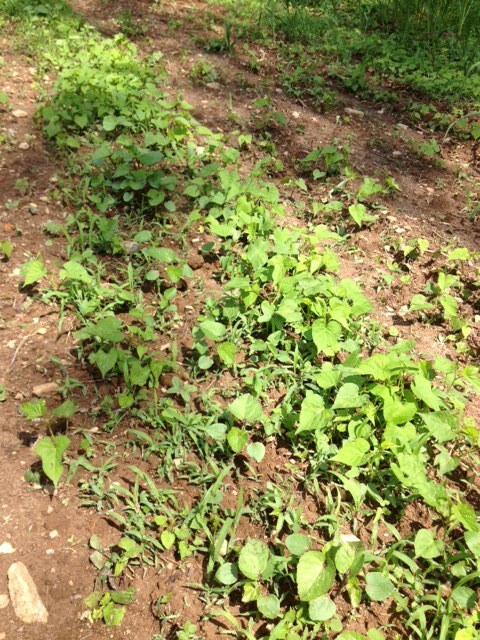 Next, the Cherokee Trail of Tears black beans’ row emerged as I diligently pulled weeds and smashed Mexican Bean Beetles as they feasted on tender bean leaves. Pleased to note only one small spot of yellow bug eggs, I hope to keep the adult pests under control before they can breed more of their kind. Okra plants, able to breathe after weeds are removed. Friends often comment about what hard work is required to hand weed. True, it is not pleasant to squat low to the ground for hours on end, but hand weeding is the most effective method of clearing space for plants to grow. Every time I weed, I recall a story told to me by a man whose father was a World War II Bataan Death March survivor. After being captured by Japanese soldiers, this man’s father was made to walk, with hundreds of other prisoners, for miles and miles. During “rest” breaks, prisoners were forced to squat for hours without allowing knees or other body parts to touch the ground. If a man became too exhausted to hold the pose, he was shot. When I weed, squatting in position for the time required, I always remember that story and I imagine how grateful those prisoners would have been to have a task that kept their minds occupied and off the terrible waiting. Hand weeding is certainly not the worst job. After admiring the two beautiful vegetable rows, I took a “break” to dig a few potatoes. Not from our 2013 rows, but from potato plants that emerged in areas where last year’s crop grew. Overlooked tubers and cut pieces, turned under in the soil last fall, have become strong plants, producing potatoes that are beautiful and delicious. Since we plan to grow other crops in this field a bit later, I acted as gleaner and harvested potatoes that would, otherwise, be wasted. In a short time, working in soft soil, I had about five pounds of potatoes in my basket. Red Thumb, a rose colored fingerling that is pink inside, Purple Majesty, a deep purple potato that has a juicy, dark purple, almost beetlike, flesh and French Fingerling, a light pink-skinned potato with golden flesh, highlighted with a dark pink ring, were prizes I found and I looked forward to using them in a fresh potato salad. With the potato basket safely stored in a shady spot, (potatoes should never be exposed to sunlight) I headed across the small stream that bisects the farm to the field where Granny’s beans are growing. Thrilled to see tiny beans forming and vines climbing their twine trellis, I set to work to rid the row of weeds. With the twine and stakes in place among the bean plants, I first weeded one side and then headed down the other side to pull remaining weeds I was unable to reach on my first pass. Almost to the end of my task, I realized the day had become very warm and I needed to stop for a drink of refreshing, hydrating water. Promising myself I would finish in just a few minutes, I spied a Mexican Bean Beetle and decided to take a quick photo of him before his life ended. With my phone in hand, I attempted to step over the twine trellis, but my boot, weighted with heavy mud, caught in the top layer of twine and over I went, my arm catching on the twine and then breaking it as I fell into the muddy garden. Saying words I shouldn’t have, I pulled my phone from where it was buried in mud and took stock of my injuries. 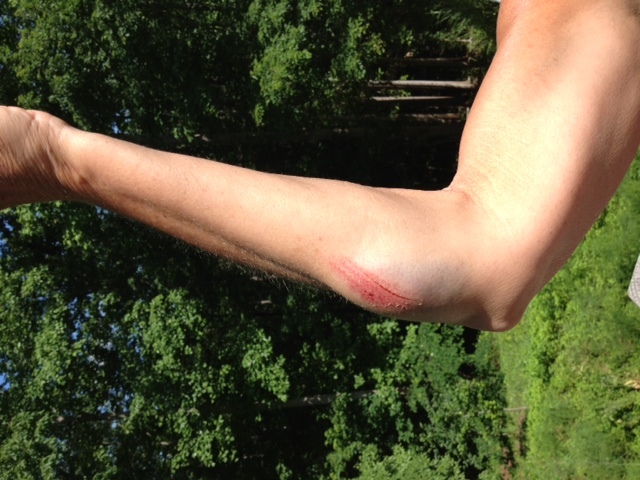 The twine scraped my arm, just below the elbow, and there was a bit of blood, but the injury didn’t look too bad. My shoulder caught the brunt of the fall and I knew I would pay for that later, but I brushed off as much of the dirt and mud as I could and repaired the broken twine. 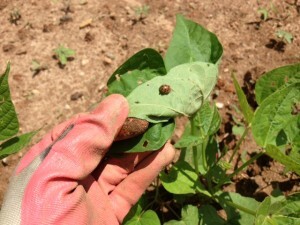 Next, I finished weeding the beans and squashed every beetle I could find. After harvesting a basket of beautiful Rocky Top mix lettuces, digging four huge garlic bulbs, pulling a few tiny carrots and picking a handful of peas, I decided to call it quits for the day. Another row of beans needed attention, but I just couldn’t make myself pull one more weed. My shoulder was beginning to stiffen and a startling bruise was emerging on my arm. After showering, I took stock of my body. 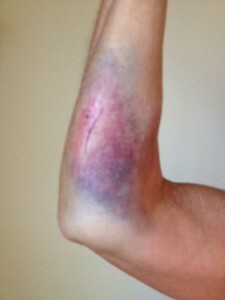 The bruise on my arm was swollen and already beginning to form some interesting colors. Other bruises were appearing on my legs and other arm and a catch in my back was noticeable, but, for the most part, I seemed to be in pretty good shape after that spill. With an aging body, I guess I just don’t bounce the way I used to. I have spent the past few days resting my arm to allow it to heal. I know those farm weeds are gleefully growing and trying to choke my plants, but I offer them fair warning: I will be back! 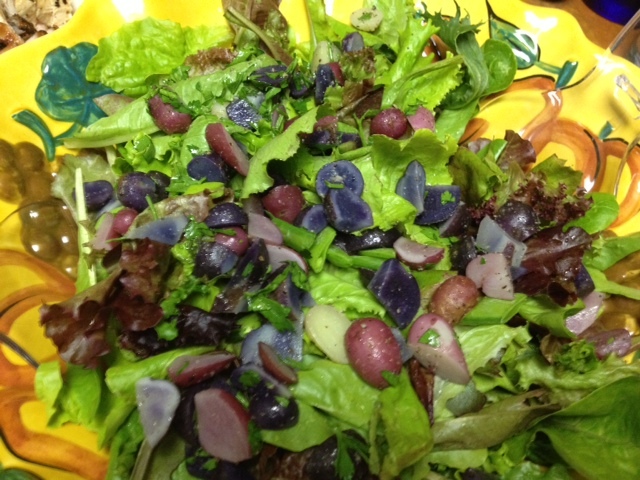 If you are fortunate enough to find some newly dug small potatoes and fresh lettuce mix at your farmer’s market or in your garden, you might like to try this recipe. Seasonal and delicious, it’s perfect as a side dish or a main course for warm summer evenings. Blend until smooth and add to fresh salad greens. Toss to coat. Top salad with potatoes. Serve with crusty bread. 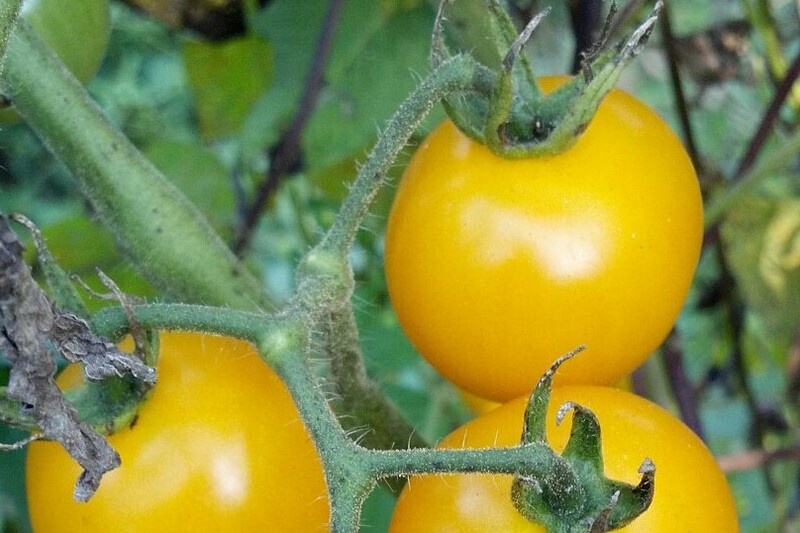 This entry was posted in Heirloom Seeds on June 14, 2013 by cindybarlowe.